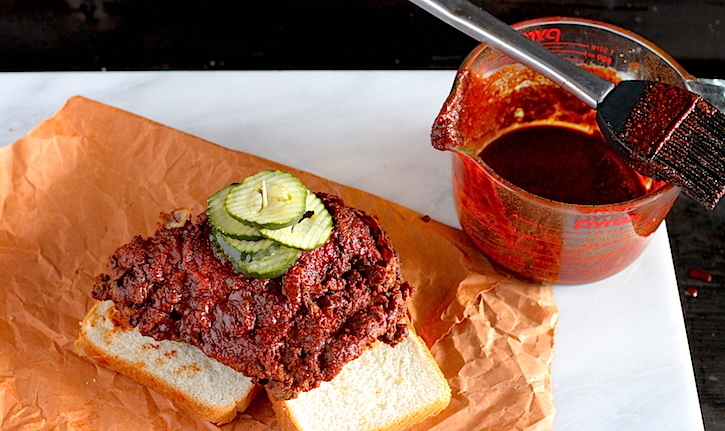 If you like spicy and you like fried chicken, then Nashville Hot Chicken should be right up your alley. Despite its popularity in the Music City, there is much left to the imagination when it comes to creating it yourself. There doesn’t seem to be a hot chicken joint in town that’s willing to part with its recipes or signature techniques. Lucky for you guys, we’re not in the habit of keeping secrets. After some research and tweaking, we’ve come up with a recipe and technique adapted to the grill that, at the very least, is likely going to make you sweat. The buttermilk bath serves to tenderize the meat while imparting a slight sweetness. Adding Death Nectar to the bath helps to insure that the chicken is spicy from the crust to the bone. You should use your favorite cut of chicken. We’ve chosen bone-in breasts. Due to the size of the breasts, we’re frying until a golden color is achieved, then finishing the cooking process in the main cooking chamber. Combine the buttermilk and Grinders Death Nectar in a Briner Bucket or other brining container. 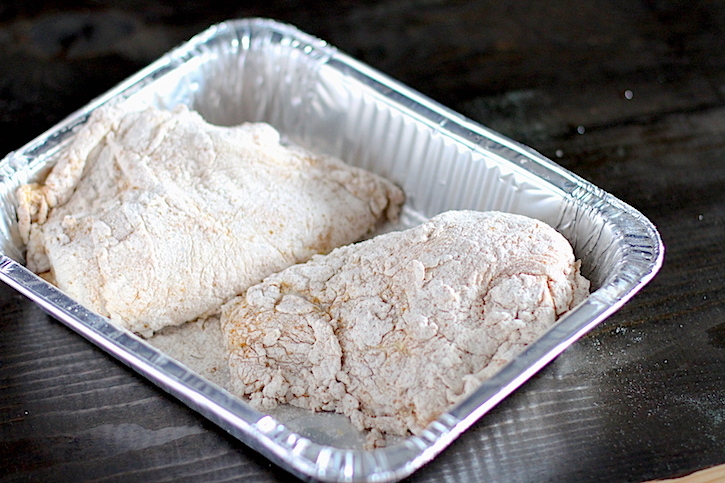 Place the chicken in the buttermilk, transfer to the refrigerator and let sit 12-24 hours. Fill a Lodge Logic 7 Quart Dutch Oven about half full with vegetable oil. Place on the infrared side burner of your Napoleon Prestige grill, and begin to preheat the oil. You’ll want the oil around 325ºF. You can check the temperature with an instant read thermometer like the Maverick PT100. Also, prepare the main cooking chamber for indirect grilling (only use half of the burners) medium heat. Combine the flour, 2 tbsp salt and Oakridge BBQ Habanero Death Dust in a half sized foil pan, or other vessel properly sized for breading. Remove the chicken from the buttermilk and dredge in the flour mixture. 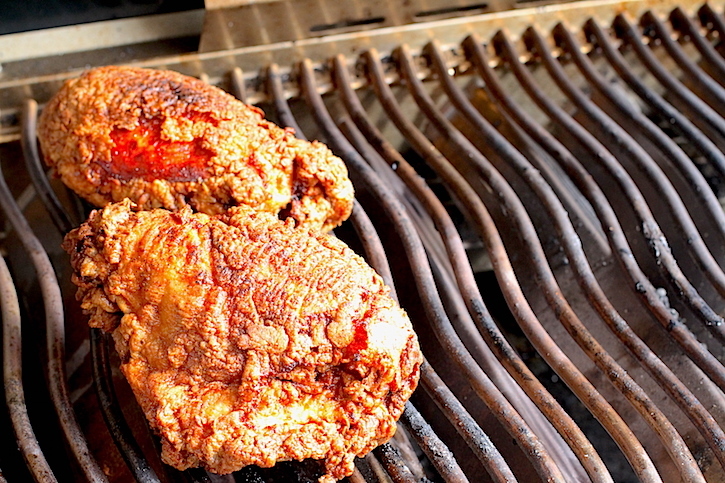 Fry the chicken until golden brown, or the internal temperature reaches 160ºF. You will likely need to transfer the chicken from the oil to the main cooking chamber of the grill and finish the cooking process with indirect grilling. While the chicken cooks, melt the lard and add to it the cayenne powder, brown sugar, garlic powder and remaining 1 tsp of salt. 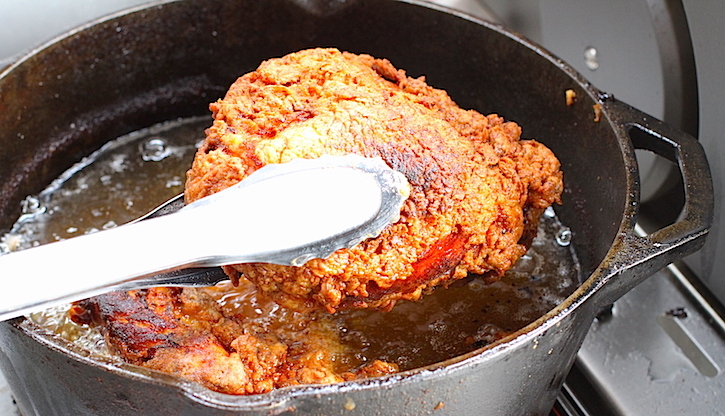 Immediately after removing the chicken from the cooker, brush the cayenne paste on all surfaces of the chicken. Serve on white bread with dill pickles.